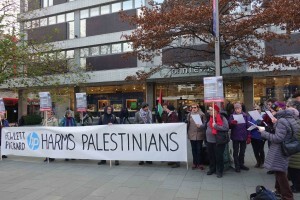 Very Good Protest outside John Lewis 26th December. We made the point that H.P. is central to the Israeli checkpoints in occupied West Bank. That is HP profits from Israeli Apartheid. 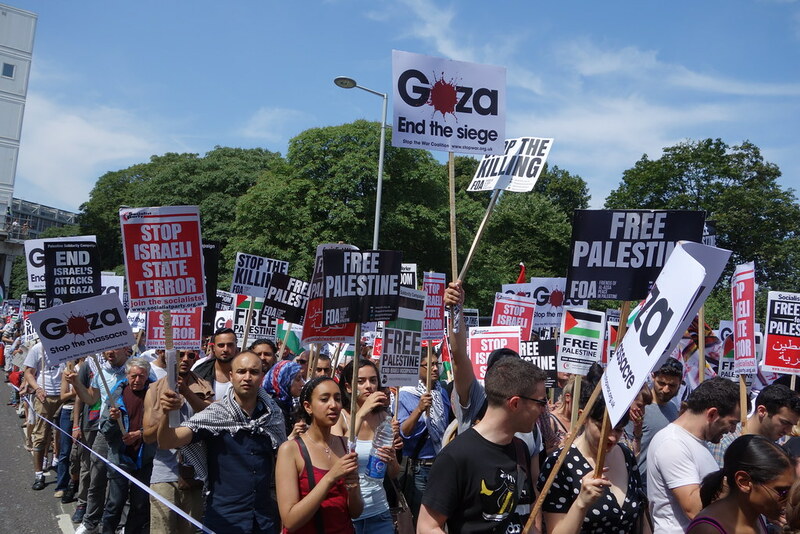 HP knowingly provides technology that enables Israel’s denial of freedom of movement for Palestinians living under its occupation regime — from checkpoints to illegal settlements to prisons to the devastating blockade of 2 million Palestinians in the Gaza Strip. 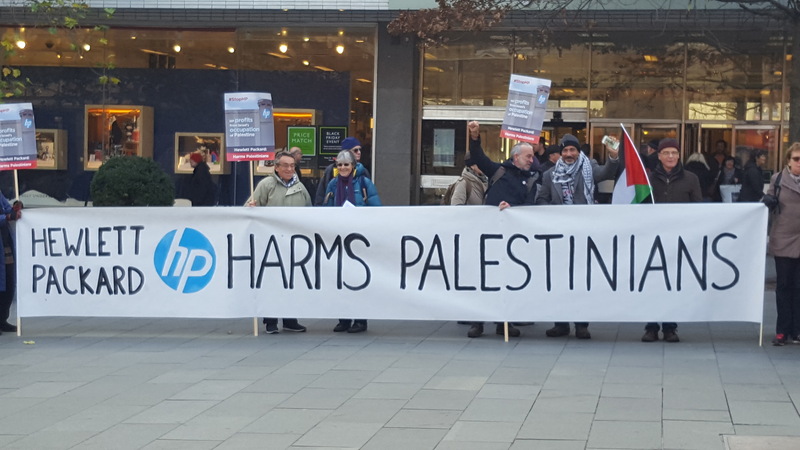 The BDS movement is poised to send a powerful message to HP with more than 90 actions planned worldwide during this Week of Action. 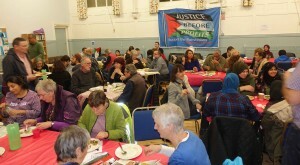 About 80 people were at this very enjoyable meal. Jews, Christians, and Muslims and others enjoyed the dancing of Shahd Abu Salama and the fantastic music. 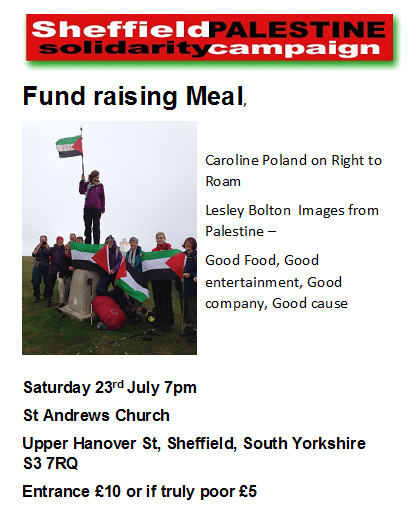 In these dark times it is inspirational that people can come together in solidarity to raise money for children’s charities in Gaza. 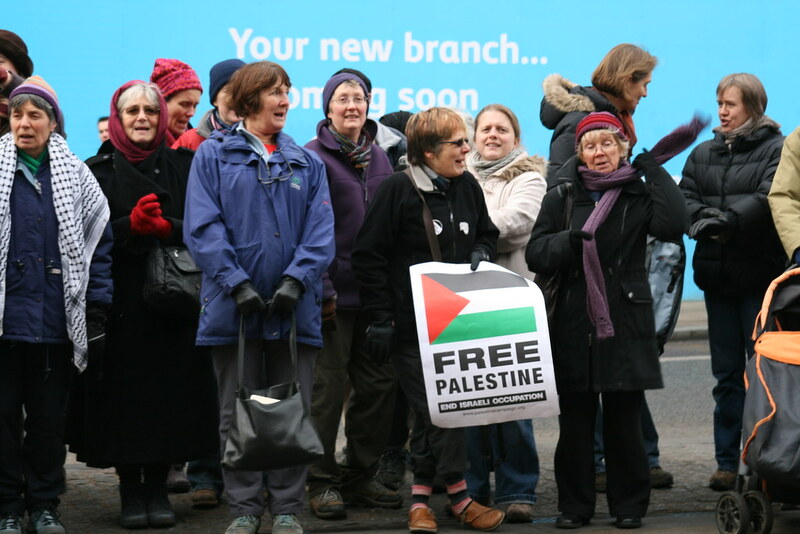 We have just sent moneys to Gaza so our coffers are bare. One of our members, Caroline Poland walked from Land’s End to John o Groats to raise money and spread awareness of the oppression of Palestinians. 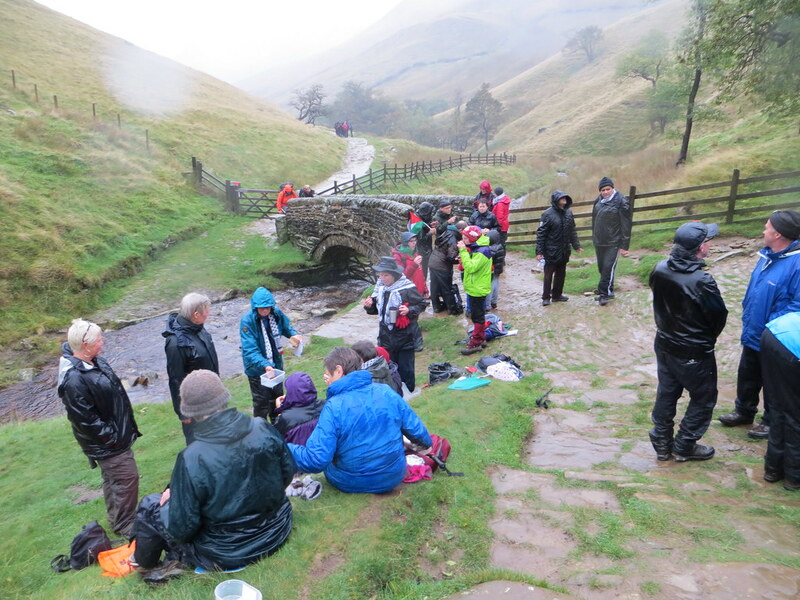 Some forty people joined her for parts of the walk. In this country people struggled to get access to our beautiful countryside. 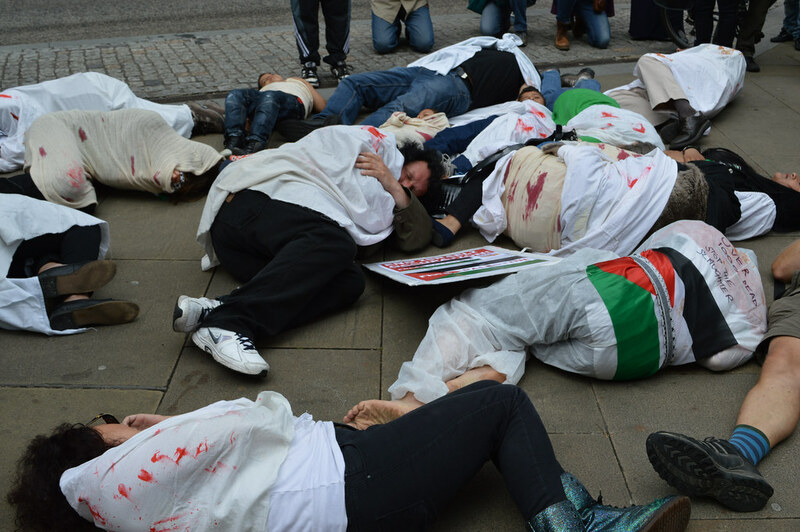 In Palestine movement is severely restricted by the Israeli Army. 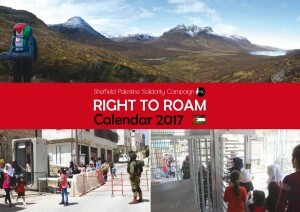 The calendar shows the contrast. Watch out for it at vigils and meetings. 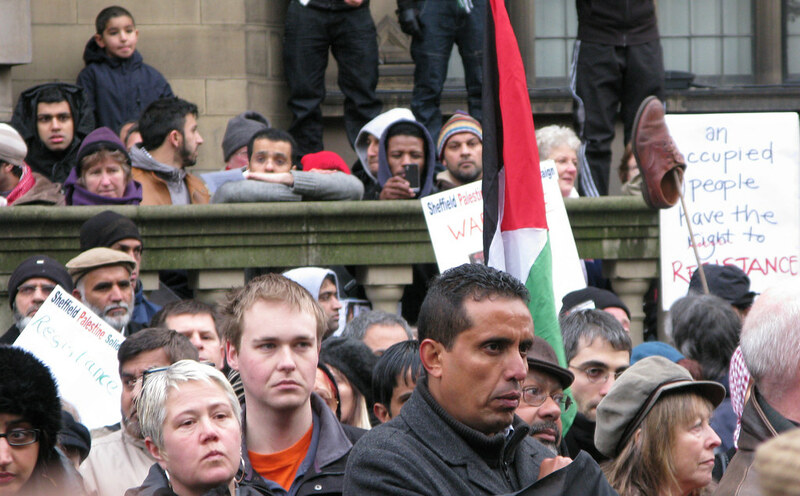 As a result, Sheffield City Council voted unanimously to adopt an Ethical Procurement policy. 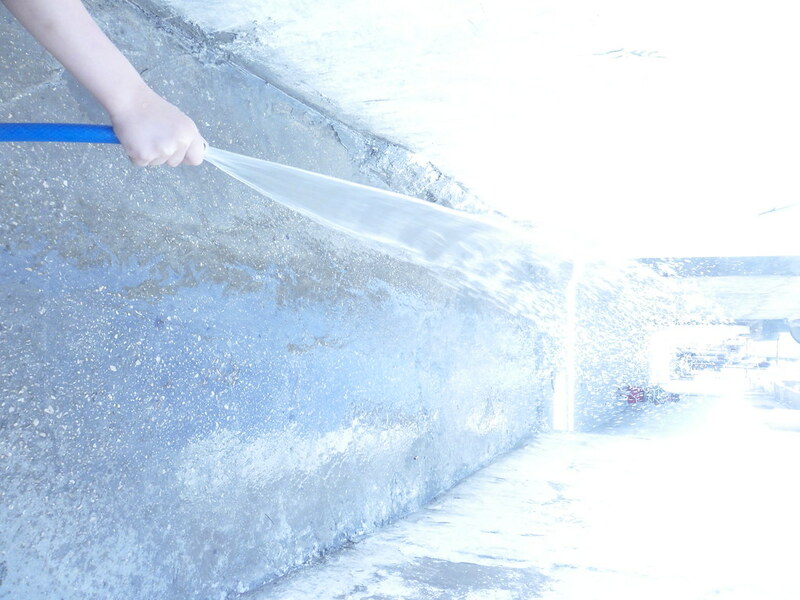 Such a policy tries to ensure that the best, most trustworthy companies are used to provide local services. But, after two years, Sheffield still does not have an Ethical Procurement Policy. Please add your name to this petition saying two years is long enough to carry out what the Council voted to do. About thirty people joined our Saturday Vigil on 29th October. We were pointing out how Palestinian farmers were being oppressed by Israel. 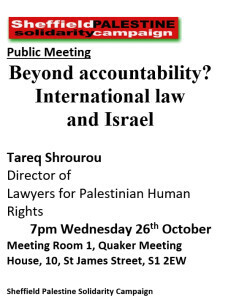 There is land theft, water theft, olive trees uprooted and much else in the Israeli imposed Apartheid state. There was very little hostility in spite of a wave of right wing propaganda falsely claiming that we are anti Semitic. 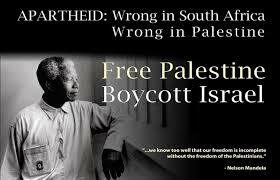 We oppose the Government of Israel and its supporters for the imposition of an Apartheid state. These words are not just terms of abuse they are the simple honest assessment of facts on the ground. 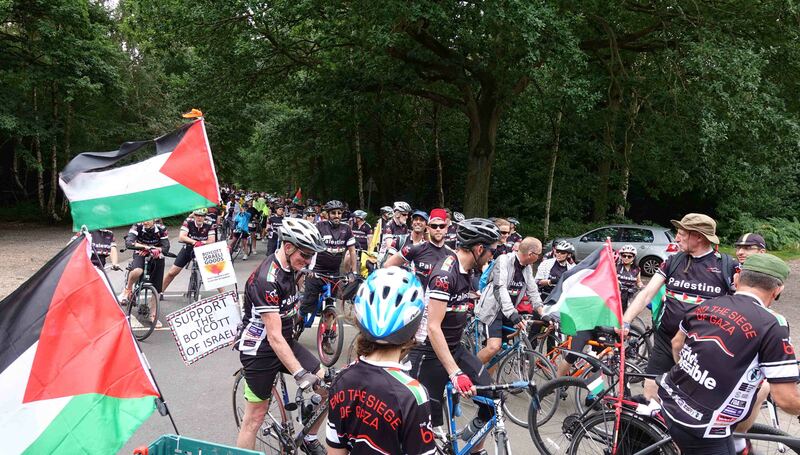 Over 200 cyclists took part in the Big Ride to Shenstone. 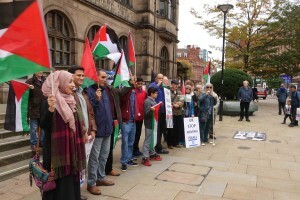 There it joined with other protesters on Monday 8th August, including a good contingent from Sheffield PSC. The wholly owned Israeli Elbit factory there makes engines for drones. Drones helped the attack on Gaza in 2014. This attack killed about 1,500 civilians including 500 children. The oppression continues today. 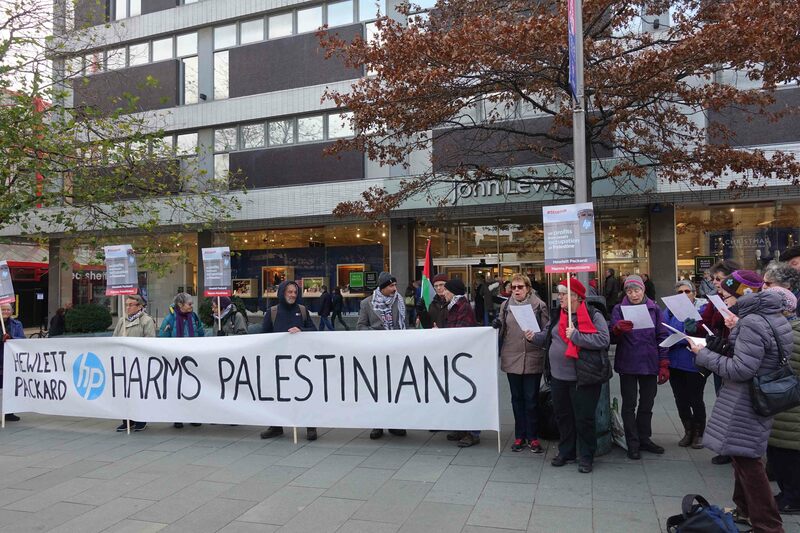 While our PSC bank accounts which help educate young women and fund children’s projects have been closed the daily business of making weapons for the Israeli military goes ahead as normal. Time to end it. There is also a lovely video of the Sheffield leg of the ride and protest. It is made by Angela Martin from Sheffield. Please have a look at it and share with friends. It is here. 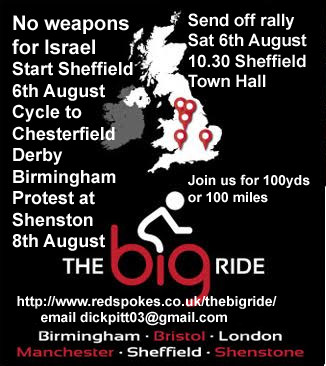 We are cycling to raise awareness of the UK’s complicity in arming Israel. Groups of cyclists from London, Manchester, Bristol, Birmingham and Sheffield will converge on Shenstone. The Elbit factory there is a wholly owned Israeli arms manufacturer. It makes parts for drones. Two years ago drones helped kill 2,200 Palestinians in Gaza. Most were civilians, over five hundred were children. Send us on our way at Sheffield Town Hall 10.30 Saturday 6th August. Or cycle with us for a hundred yards or a hundred miles. Or you can drive to Shenstone on Monday the 8th August to join the protest.